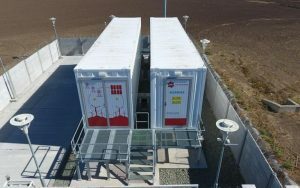 EDP Renewables opened the first energy storage station in Romania, in Constanta. It is an energy storage system in Cobadin 1 wind Farm. This system represents the way in which the wind farm will flatten the forecasting differences, of generated electricity. The location of the wind energy storage system with batteries, with a capacity of 1.26MW/1.368MWh, included in the Cobadin Wind Farm is next to the 33/110 kV Cobadin 1 EDPR Station. EnergoBit has installed the Siemens containers where the batteries and inverters are located, integrated the equipment into Cobadin Station SCADA System, executed all civil constructions, the connection between the battery and the station, the installation of the medium voltage connection cell in Cobadin station. The 1,26MW/1,368MWh electricity storage battery has been mounted in 2 thermally insulated metal containers located on a specially arranged platform near the station. In one of these 2 containers is a 1250kVA, 0.36/33kV transformer, which allows the batteries to be connected to the National Power System via a new cell in the transformer station. 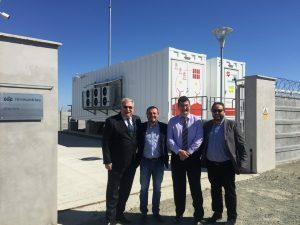 By installing the energy storage facilities in the two containers at the new BESS (Battery Energy Storage System) location, there have been performed works on adapting the command, control and protection system existing in the Cobadin 1 power station. Being EnergoBit’s first storage project, we want to further develop these capabilities, to get involved in as many projects as possible and to find optimal solutions to be able to work fully with our own teams. Congratulations to the colleagues involved and we hope to have as many achievements as possible!